Find hotel near Basilica Cattedrale Di Sa .. 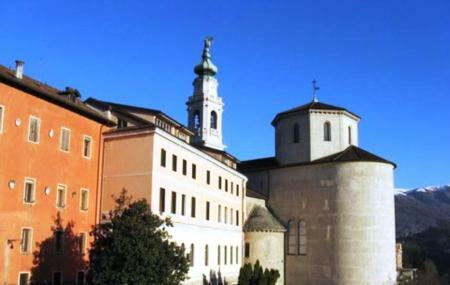 The Basilica of St. Martin is an old structure in Belluno that is dedicated to Martin of Tours, the saint who was believed to have lived in the fourth century. It is presumed that this cathedral dates back to the Dark Ages or the Middle Ages and it was rebuilt in 1517 by the architect Tullio Lombardo. Reconsecrated in 1878 after a series of restorations, the church still preserves the paintings by Cesare Vecellio, Palma the Younger and Jacopo Bassano. The crypt has a work of Giovanni Francesco da Rimini. The façade of its structure is characterized by portals made on the initiative of Bishop Alvise Lollino. Moreover, its huge entrance bronze doors have been designed by the sculptor Angelo Canevari and depict the three theological virtues with humility, the coats of arms of Bishop Ducoli and the town of Belluno, the written Ave and Pax. You are advised to visit this cathedral between 9am-4 pm. How popular is Basilica Cattedrale Di San Martino? People normally club together La Fontana Di San Gioata and Diocesi Di Belluno-Feltre while planning their visit to Basilica Cattedrale Di San Martino. This is a magic place... 😊I love it! Bella cattedrale, uno dei simboli di Belluno con il campanile di Juvarra visibile da lontano con una grande statua di angelo in cima. È presente anche una bella cripta e un grande organo a canne. È un bel duomo. Non imponente come le grandissime cattedrali più famose, ma comunque pieno di opere d'arte bellissime. Ha un clima molto tranquillo e raccolto. Il campanile è riconoscibile da lontano e da qualunque posizione.